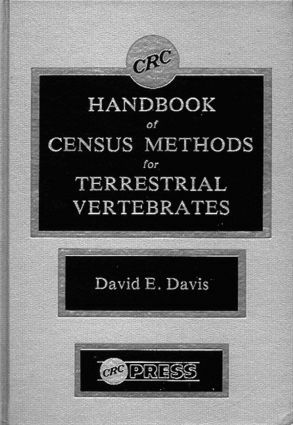 Learn how to start a census program for terrestrial vertebrates with this handbook. Whether the information you need is for managing a population, surveying environmental impact, or conducting research on a particular species, this handbook has it all. Principles, methods, and calculations are explained. The following information is given for each species: name; range; reasons for census; life history; items of importance, e.g., migration; methods of census; recent and pertinent references; and comments about the various methods. CONTENTS: Introduction. Methods for Species: Amphibians and Reptiles. Methods for Species: Birds. Methods for Species: Mammals. Various Species in a Habitat. Index.